Established in 1974 as a Davenport Machine Shop, M&R Engineering has grown into a large Davenport and CNC Machine Shop. Over the years, M&R Engineering built an outstanding reputation for excellence and innovation in custom machined parts. Delivering high-performing custom machined metal parts means starting with quality metal machining materials. That’s why M&R Engineering has fast and economical access to large quantities of today’s best materials, allowing us to meet short and long-run orders quickly and cost efficiently. 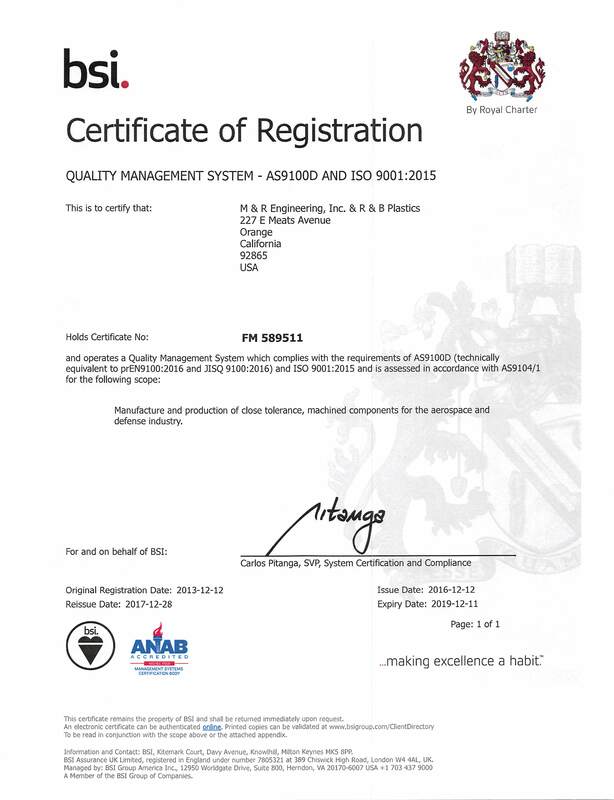 We are AS9100 and ISO 9001 certified, and our materials come from suppliers who share our commitment to quality. We have vast experience in machining parts including brass, copper, aluminum, cold rolled steel, stainless steel, titanium, and other metal materials. Why choose high precision CNC metal machining over 3D printing? High precision CNC machining is a subtractive process in comparison to the 3D additive printing process. Currently, 3D printing has limitations when it comes to metal material selection. The most popular materials used in 3D printing are plastics. Also, high precision metal CNC milling and CNC turning offer 15x more accuracy of 0.001 inches. Compared to 0.016 inches in 3D printing. Metal parts manufactured by 3D printing are currently undergoing substantial testing for strength and usability. Due to the fact that 3D printing is a quieter, less messy process that requires less programming and operating resources. Which makes it a good solution for odd-shaped low tolerance and low volume prototyping when material selection is not important. However, for high precision, high tolerance metal parts, we recommend something else. We recommend high precision CNC milling, and high precision CNC turning. They are the best options for custom machined parts by far. In 2007, M&R Engineering acquired R&B Metals to expand capabilities into high precision CNC machined Metals parts. To this day, we deliver high quality parts to R&B customers.